Aqua..that’s Spanish for water. And that’s what this great looking resort is all about. It’s the water. Beautiful, emerald green gulf aqua that just laps up to white on white sand. It’s a picture postcard kind of resort. Aqua both creates and enjoys enchanting views of the beach. You’ll know you’ve arrived at one of the most distinctive resort communities when you step into the grand lobby and there’s this really cool cascading water feature that draws you into a whole resort that’s created for your relaxation and entertainment. There’s a poolside café, the whirlpool spa and the majestic beachside terrace of pools, fountains and water gardens—Aqua is the ultimate cool beach front resort in Panama City Beach. 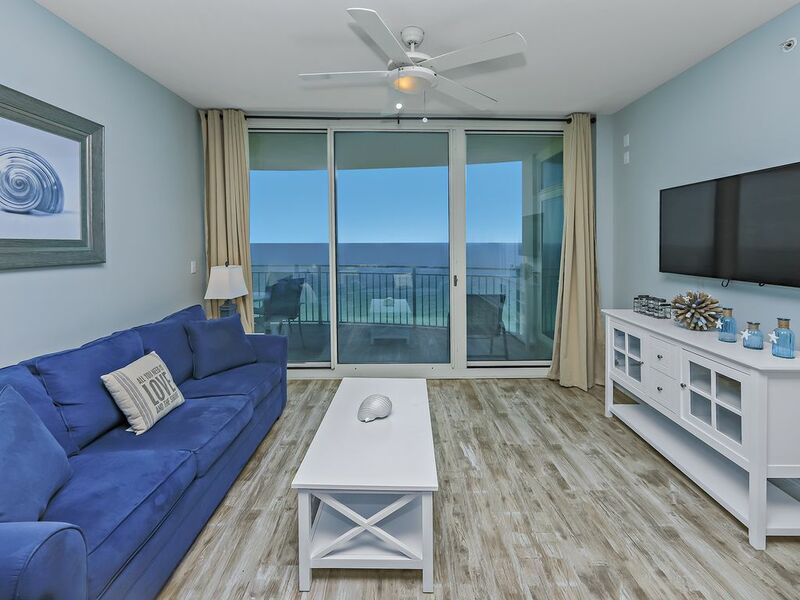 All the beauty of resort living and all the comfort of home, If you wrote down everything you wanted in a resort, you’ll probably find it here at Aqua. While at Aqua you can enjoy on-site pampering services such as aromatherapy and steam treatment rooms, free access to a DVD movie library, as well as a supervised Kid's Club during peak vacation seasons, a poolside party room, an event center and more. This place rocks! Man is this place something else! Check out the photographs of the décor. It’s kind of Manhattan meets the beach. It’s really very upscale in the way it looks. It really makes the most of the room in every room. There’s plenty of space for all your beach stuff, but that’s not why you’ll pick this condo. It’s got great views. Plain and simple. The LIVING ROOM sofa is big and comfortable. The entertainment center, which is entertaining just to look at it has a big TV, looks like a 35”. The DVD player lets you play movies when you’re beached out. Or, surf the net with the high speed connection. But, I have to tell you, the views are going make all that pretty tough. You’re eyes will wonder to the beach every time. You’ll like the balcony, too. It’s really comfortable. And the views, The views. There’s also a cool game table that can be used as a little breakfast nook. Check out the MASTER BEDROOM. Huge king size bed with a with a beautiful walnut toned headboard. Look at the wall colors. What a great space. And the bed’s really comfortable. I laid down on it to see how it felt. Almost went to sleep. Really makes a statement. It’s really spacious. There’s another pretty big TV, and a DVD player. The Master Bath is just as impressive. The SECOND MASTER is really cool. More great color and a terrific queen-sized bed! Check out the picture. The GUEST BEDROOM is a kid-friendly suite with 2 twin beds and enough room for playtime. The KITCHEN’s a beauty with black granite counter tops. It’s open and has everything that you need, so no matter whether you’re cooking your specialty or just fixing grilled cheese sandwiches you’ve got everything you need to please the family. There’s a big kitchen bar with four bar chairs so you can grab a quick bit before you hit the beach. The DINING AREA has a big table, really comfortable so everyone’s got a seat at the table. No kid’s table here. These bedrooms and the pull out sleeper sofa in the living room make sleeping room for 8 with 3 full baths. Two King-Sized Beds, Two Twin Beds and a Queen-Sized Sleeper Sofa. The best thing about this vacation condo, the view! Which you can get from two different bedrooms! If you're an adventure seeker like me, you know a condo is a spot to sleep and eat, what really matters is what is around you. The most beautiful beaches in the world, fresh Florida seafood, and a variety of memories to make. Thanks Best Beach Getaways, see you soon! The best family vacation by far! This was our second time renting through Best Beach Getaways and again we were super pleased. Our family of 5 stayed at Aqua for a week and didn't want to leave. The gulf views of the sparkling, refreshing water were amazing. We spent most of our days down at the beach, soaking up the sun. My daughter went on the jet skis ($60 for 30 min) and saw dolphins! The room is well taken care of and clean. We no issues waiting on an elevator (besides the first day) and security was always around if I had any questions. Beautiful condo, decorated with a nice beach theme. We had plenty of dishes to cook with. We enjoyed eating breakfast on the patio every morning. There are MANY things to do within walking distance. Pier Park is less than five minutes from the condo and had many, many shops and restaurants. Frank Brown Park was a few minutes away and even has a little water park for the kids. Thank you for a great vacation and relaxation. NEVER RENT THIS PLACE! Horrible! For the price, this place was horrible. The carpet is old and filthy (kids feet were black with dirt in 20 minutes- I wore flip flops the entire time), the dishwasher is broken, there are only about 8 glasses (not well stocked kitchen), the bed covers were just old throw blankets and there were no bed skirts so it did not look appealing, ceiling fans were filthy with a 1/2" of baked on dust on them, the 2 lounge chairs were broken, the out door table was shattered in many spots, the drawers were mildewed so your clothes smelled so bad we had to stop using them, and there was no 1 hanger in any closet to use. BUT the WORST was the A/C unit that ran all the time and leaked water all over the floor and into the carpet so we were sloshing through water every day. the bath fans run LOUDLY when you turn the lights on so no peace in the bathroom and lighting in bathroom was terrible. We had maintenance people in every day working on issues, most which were never resolved. Washer and dryer is not closed off so you had to listen to it all the time. To the property mgmt co's credit, they did give me a credit of some money which helped ease the pain of feeling like I had no vacation. If you do not care about asthetics and just want to look at the ocean this place is fine, but if you like nice furnishings and flooring, this place is subpar. We want all of our guests to be very satisfied with their vacation rental experience. And we appreciate all guest feedback. However, when the feedback isn’t accurate we always want to set the record straight. This Guest called in to report that the dishwasher was not working the day after they arrived. We sent our maintenance team immediately to repair the dishwasher. The Air Conditioning unit drain line did overflow (it’s condensation and overflows if there’s a blockage in the line) but was repaired the same day and has not been an issue since. The Air Conditioner will only run based on the temperature set by the guests. The loungers the guest referred to are not broken. We have verified this during inspection. The glass table does have small superficial cracks inside the glass, but is sturdy and usable. Bathroom exhaust fans are no louder than acceptable for a fan and the lighting is sufficient. The guest did not report any housekeeping issues to us during their stay. If they had, we would have responded immediately and correct them. I stayed here for my son and nephew's basketball tournament and it was perfection! Absolutely loved everything. Having 2 of the bedrooms on the gulf made picking rooms for my sister and I much easier! We both got to enjoy listening to the waves each night. The boys got the room with the twin beds and their own bathroom, which was great. The condo had everything we needed and was so comfortable and clean. I loved the easy access to Pier Park and dining at Shuck'ums without having to get in the car. Best Beach Getaways called me to let me know our unit was available early which was great. I will only be using Best Beach Getaways when we come to PCB and my first choice will be Aqua!!! O.K. gang,......Our family of 4 (dad, mom, 22 yr old son and 18 year old son) Loved this condo. Were there little blemishes, yes, were they deal breakers absolutely not. Aluminum pots and pans scratched but stainless steel pots were perfect... plates, glasses, coffee mugs, bowls & flatware all fine. Had a blender but always travel with our own. Sofas are clean and nice but have been recovered and have sink holes but its not a big deal. Beds are great bathrooms are great (3) Love this!!! The great things about this condo, BRAH, YOUR AT THE BEACH!!!!! EXCELLENT CONDO FACILITY, EXCELLENT UNIT, VIEW IS SPECTACULAR!!!!! Elevators are fabulous!!!! Saturdays are always slightly sticky, for a while but if you realize its around 3-6 and hang out on the beach or pool or whatever and just not going up or down a lot its so not a big deal. Remember you and yours had to get moved in for the week yourselves. We were all 4 able to use the hot tub one early evening after coming up from the day on the beach. We had it all too ourselves. Location cannot be beat. We were able to walk back and forth anytime to Pier Park. 19th floor is high but absolutely spectacular. We saw stingrays in the early evening as well as a family of 3 dolphins each day. When we played in the ocean we saw fish, crabs and my youngest son found a baby spotted stingray. Some locals saw it and said they had never seen one like that before. Oh and at night it was just as fabulous. We walked one night from 10p.m. till 2:30 in the morning with lots of other families doing the same. From your balcony everyone looks like little dancing lights, people talking, laughing, children laughing & waves crashing all at a lull. Not loud but beautiful sounds of happy lives. Loved this condo and the memories it allowed our family to make. The nit picky stuff we laughed and scoffed at because what you get back is so much more. ENJOY LIFE make the most of it.....while you can. We did. We really like Aqua but were very disappointed in this condo. The carpet was filty. The balcony was just as dirty along with the balcony furniture. We noticed a strong smell when we first stepped onto the balcony. Someone had left a wire basket of small crabs there. They had all died and were rotting. One of the master bedroom lamps didn't work and was about to come apart. The ceiling fan in the den literaly did start to come apart when we turned it on a higher speed than low. The toliet in one of the extra bedrooms hadn't been cleaned in a while. The refrigerator smelled as though it had been a while since it's last cleaning as well. It's really a shame. This is to nice of condominium complex to have a unit in this poor condition. Stay at Aqua, but not this unit. The pictures don't tell the whole story on this one. As you will note from prior reviews, this is a great unit that most guests loved. We ask all guests to let us know if they have any issues during their stay. This guest never communicated any of these issues during their stay with us. If they had they would have been resolved immediately. Given the popularity of this property, the carpet is in need of replacement which we will review with the owner this fall. The ceiling fan has been repaired since (Our inspector discovered the issue the following weekend and reported it).